Growing up in Georgia, I remember Atlanta for one thing: the traffic. Thus, I have staunchly avoided visiting Atlanta as a tourist. Turns out, I’ve made a mistake. The drive to Atlanta from South Carolina actually has a lot going for it. A trip down I-85 includes passing Tanger Outlets in Commerce, Georgia, and Chateau Elan in Brazelton. Yet finding accommodations in Atlanta is overwhelming as there are so many hotels downtown, in the suburbs, and around the perimeter.I felt lost before I even began. I finally settled on Staybridge Suites Atlanta Perimeter Center East; I wanted to be outside the perimeter but still close enough to easily access our places of interest. The hotel was spotless, safe, and offered a delicious complimentary breakfast. 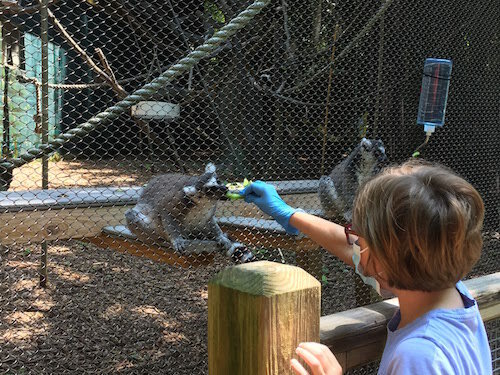 We fed the lemurs bell peppers during our Lemur Encounter at Zoo Atlanta. The Lemur Encounter is one of the less expensive animal encounters at $35 a person, plus zoo admission. Our day began at Zoo Atlanta with panda and lemur encounters. I’m not exaggerating when I say that this was one of the coolest experiences of my life. 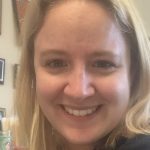 My eleven-year old and I donned lab coats and booties, along with hair nets and masks, and, along with the seven other members of our group, toured the panda exhibit, spoke with panda experts and animal nutritionists, and then got to feed “panda treats” to one of the zoo’s adult pandas. My daughter feeding an adult panda during our Panda Encounter at Zoo Atlanta. Each person had a chance to feed the panda and spend a couple of minutes up close with these amazing animals. Being up close with this animal, I was taken aback by its beauty and power. 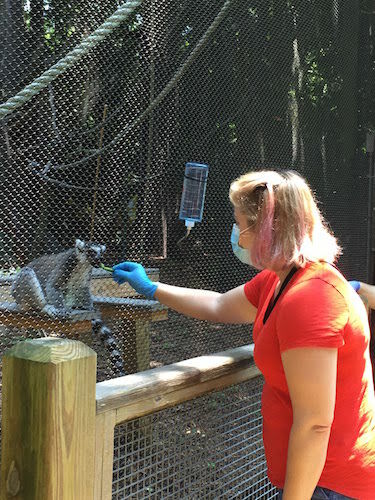 And since my daughter’s favorite animal is a panda and mine is a lemur, we also took part in a lemur encounter (significantly less expensive than the panda!). My daughter and me at the Martin Luther King, Jr. National Historic Site. Free parking and admission. 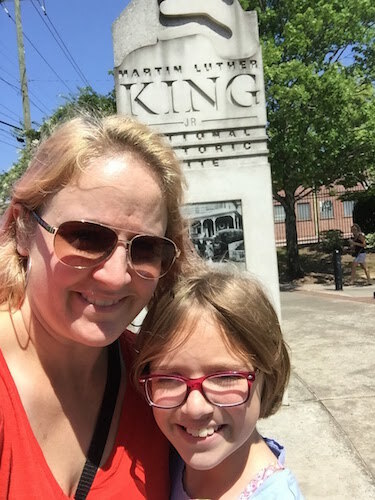 After our morning at the zoo, we saw signs on the freeway leading to Martin Luther King, Jr. sites, and so we decided to visit. The Visitor Center provides an interactive framework before exiting to the King Center and the tombs of Dr. and Mrs. King, as well as the Eternal Flame. 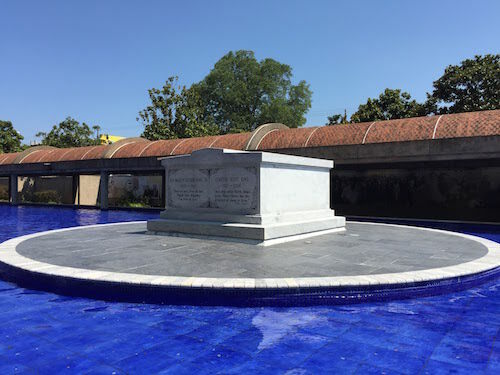 The tombs of Dr. and Mrs. King, located just across the street from the MLK National Historic Site, in the King Center complex. We toured Ebenezer Baptist Church and though we were too late for a tour of the birth house, we journeyed up the street to see it. Parking and admission to these sites are FREE. My daughter couldn’t believe the portion of her “side of fruit” at The Colonnade in Atlanta. Meanwhile, I was excited about my pear salad and warm yeast rolls! Dinner was served at The Colonnade, an Atlanta establishment dating back to 1927. I had fried chicken (thinly battered and crispy!) with sweet potato souffle and pear salad, a Southern staple I’ve never had the pleasure of ordering at a restaurant! 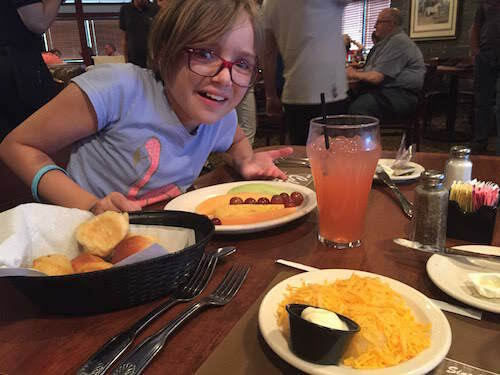 My daughter had mac and cheese, applesauce, and mashed potatoes. They also offer pot roast, and turkey, among other classic meat and three offerings. 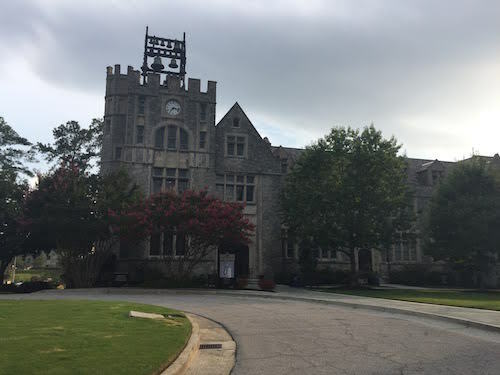 Oglethorpe University–my daughter thought we had found Hogwarts! We finished our evening driving through Oglethorpe University. If your kids love Harry Potter, then they must see this Hogwarts in Georgia! This small, liberal arts university’s Gothic Revival architecture and rich history has landed it on Georgia’s Registry of Historic Places. Even the football stadium looks like a Quidditch pitch! 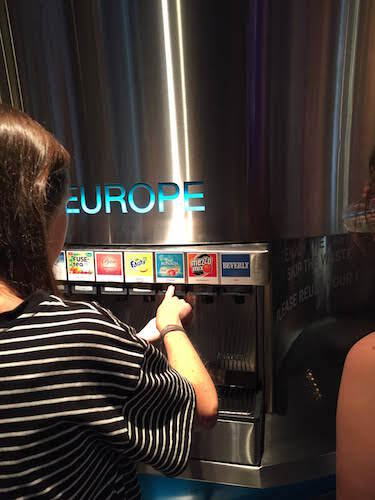 The tasting room at World of Coke where you may taste Coke products from around the world–with no limit! After a wonderful night’s rest, my daughter and I spent the morning exploring Centennial Olympic Park and visiting World of Coca-Cola. The tour began with a complimentary can of Coke as we were given a history of the product and its impact on pop culture. Once we entered the museum proper, we were led into a “vault” where the kids had to crack the code through virtual reality, allowing us in to see where the original recipe is stored. We took park in a 4D simulation and got to sit on an actual couch from the American Idol set. We wrote our favorite “Coke” stories and added them to a magnificent global collection and saw the Coca Cola polar bear. But the highlight was, of course, the tasting room. 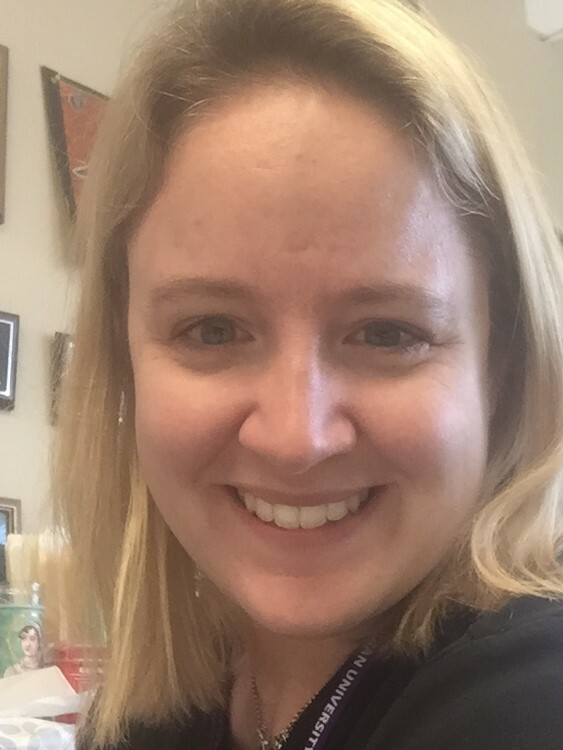 We tasted Coke products from around the world, and I will never forget my child’s face when she tasted the terribly famous “Beverly.” Our experience there was definitely a highlight of the trip and a great use of our time and money. We ended our trip at The Wren’s Nest, the home of The Tales of Uncle Remus author Joel Chandler Harris, and on the last tour of the day with 87-year old Nannie Thompson. She grew up on Harris’s stories and so presents her personal view of the culturally controversial figure. Even my eleven-year old was captivated by Nannie, especially when she took us into the room where Harris died, a room that hasn’t been touched since. The Wren’s Nest holds story-telling on Saturday afternoons, making that the best time to visit with children. Thanks for stopping by our “Hogwarts” campus – please come back any time!